World Alzheimer’s Month is the international campaign to raise awareness and challenge the stigma that surrounds dementia. September 2018 is World Alzheimer’s Month (WAM), including World Alzheimer’s Day (WAD) on 21 September. The 7th global WAM utilises the theme of “Every 3 seconds” to emphasise the huge global impact of dementia worldwide. As every year on World Alzheimer’s Day, many Alzheimer associations and other stakeholders around the world organised advocacy and information provision events to show the global impact of dementia and promote dementia awareness. September has been a busy month for our EPAD partners and TDCs, with a number of meetings and events taking place to join the World Alzheimer’s Month campaign. This year, we are glad to report some activities done by our Epadistas. The Pasqual Maragall Foundation, which prompted the Barcelonaβeta Brain Research Center (BBRC), is celebrating its 10th anniversary. With the aim to “bring back” memories to its founder Pasqual Maragall, who was diagnosed with Alzheimer’s disease in 2007 and created the foundation one year later, the foundation launched a book in which 40 friends of the former mayor of Barcelona and president of Catalonia remember an anecdote with him. Part of the benefits of the book will go to the research on Alzheimer’s prevention carried out at the BBRC. The book was presented the 20th of September in Barcelona, in an event with more than 600 attendants. Also coinciding with the World Alzheimer’s Day, the Pasqual Maragall Foundation, together with “la Caixa” Banking Foundation, covered the names of the plaques of several streets in the Ópera neighbourhood in Madrid. The aim of the street campaign was to raise awareness about the symptoms of Alzheimer’s disease, such as disorientation, and the need to invest more money on research. You can see the video of the campaign here. This year, on World Alzheimer’s Day and through World Alzheimer’s Month, Biogen engaged in various educational and communications initiatives, to share the depth of commitment, passion and ambition of the people working in Alzheimer’s. From research & development, medical and patient advocacy colleagues across the company delivered a message of defiance in bringing innovation to the Alzheimer’s disease community. 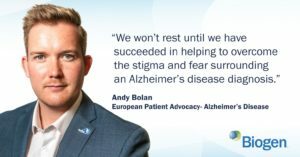 Specifically, Biogen partnered with the European Federation of Pharmaceutical Industries and Associations (EFPIA) to publish pledges committing to the clinical research and tackling of stigma in Alzheimer’s disease. 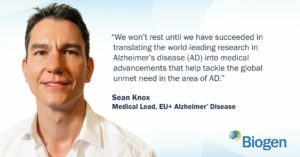 Throughout September Biogen also worked with RAND corporation to highlight health system readiness in Europe to new Alzheimer’s innovations. Outside of Europe, Biogen supported several of the Alzheimer’s Association “Walk to End Alzheimer’s” in the US. As a company Biogen is proud to demonstrate its commitment to the millions of people living with Alzheimer’s disease and their loved ones. Biogen has made a long-term commitment to furthering Alzheimer’s disease research and treatment, and remains driven by the profound unmet needs of patients, families, caregivers and society. Together with the French Alzheimer association « France Alzheimer » of its department, the CHUT organised an event on World Alzheimer’s Day entitled «Changeons de regard pour comprendre et agir ». Dr Pierre Jean Ousset gave a presentation on Alzheimer’s disease. The programme could be downloaded here. Several events were organised on World Alzheimer’s Day in Lille including a meeting to celebrate the 25 years of the Bailleul advanced consultation. This meeting organised for the general public at the “centre médical des monts de flandres” involved many CHRU’s consultants. Moreover, CHRU had a great media coverage. TF1, the private national French TV channel considered as the most popular domestic network, diffused a TV reportage on their “centre de la mémoire”. As every year for the World Alzheimer’s Day, the well-known Millennium gym in Brescia – located in front of the Brescia’s Institute “IRCCS Centro San Giovanni di Dio Fatebenefratelli” – organises an event called “Move for Alzheimer / Muoviamoci per l’Alzheimer” to raise funds and support research for Alzheimer’s disease. This year, the event lasted one week (September 13-21) and the program consisted of a series of sporting events aimed at the entire population, such as pole dance, soccer and yoga. During this occasion, some researchers of the IRCCS Fatebenefratelli took the opportunity to explain the research activity of the Institute at dedicated stands. The programme of the event could be downloaded here. On September 21, an informational meeting aimed at patients and their relatives was also organised at the IRCCS Fatebenefratelli to increase the awareness on Alzheimer’s disease and patient’s care. The Chief Medical Officer, the director-General, a clinician and a qualified trainer of the institute had the opportunity to be speakers at this event. Each year on September 21, which marks World Alzheimer Day, an international campaign is being organised to raise awareness and challenge the stigma surrounding dementia. Janssen R&D Neuroscience organised several internal initiatives to bring attention to this disease. A fourth edition of the Janssen Talk Café Dementia was hosted at Janssen Beerse, followed by a play about caregiving. For this edition, Janssen R&D Neuroscience focused on ‘treatment of dementia – the key to success’. In this interactive session, Janssen employees were invited to get more insight into what is known about Alzheimer’s disease treatments. Additionally, cupcakes were sold to support Alzheimer’s research (Stichiting Alzheimer Onderzoek). On Sept 21st Karolinska Institutet and Theme Aging, Karolinska University Hospital, recognised the seventh World Alzheimer’s Day. They took the opportunity to attend lectures from frontiers, among others Prof Miia Kivipelto and her team, within the field of Alzheimer prevention, diagnostics, and treatment. In a parallel event, sponsored by the Swedish Alzheimer Foundation, Associate Prof Alina Solomon gave a lecture regarding how we can prevent dementia and multi-domain interventions. After that, a joint visit to their new Memory Clinic at Karolinska University Hospital Solna was organised. During the evening of the same day Prof Kivipelto traveled to Helsinki, Finland to participate in the gala event of Alzheimer Association Finland. She received the first time ever gold medal awarded for her contributions for dementia prevention and patient care. For the World Alzheimer’s Day, France Alzheimer organised an event from 21st September to 23rd September in Paris. In the space of these three days, several topics were presented and discussed including adapted physical activities, prevention, early diagnosis, treatments, scientific research, nutrition and carers in professional activity. 33 hours of workshops and 17 presentations were planned on the occasion of the 6th edition of the “Alzheimer Village”. The program could be downloaded here. We are glad to see that thee members of the Paris Nord GH de Lariboisiere contributed to this event. On 22nd September, Dr Julien Dumurgier and Aurelie Meauzoone gave a presentation about the early diagosis. Pr Claire Paquet reported about the frontotemporal degenerations and the Lewy body disease. In Tayside, the team had an exhibition stall promoting dementia research in the Clinical Research Centre at Ninewells Hospital in Dundee. In addition, there’s been some activity on their social media accounts. On the occasion of World Alzheimer’s Day on September 21st 2018, a Geneva’s Alzheimer day has been organised in the University Hospitals of Geneva (HUG), by the Swiss Association for Alzheimer’s Research (APRA). The programme could be downloaded here. During this day, a series of talks took place in the presence of the officials of Geneva’s city, among which a presentation of the Geneva Centre de la Mémoire. During his presentation, Prof. Frisoni explained the role of the center as a central point of contact for patients and researchers and gave exposure to the research projects led in Geneva. To complete this day, a concert in favor of the APRA 30th birthday was given in order to unite the different stakeholders around a festive event. World Alzheimer’s Day (21st September) was launched in 1994 to mark the 10th anniversary of Alzheimer’s disease International (ADI), who is the umbrella international organisation of 90 Alzheimer associations around the world. Originally, this day is part of World Alzheimer’s Month, where organisations coordinate to create global messages about dementia for the media, key stakeholders and policy makers. ADI coordinates the World Alzheimer’s Month campaign through their members, supporters and corporate partners. September 2018 marked the seventh World Alzheimer’s Month campaign. Its primary objective is to reach out to as many countries as possible, showing the global impact of dementia and promoting dementia awareness and what we can do to help support those living with the disease. The theme for this year’s World Alzheimer’s Month campaign is Every 3 seconds. Every 3 seconds someone in the world develops dementia.